Description: Beauty and privacy abound in this 2600 sf custom cedar home with 3 bdr and 3ba. Set off the road on a 39-acre secluded wooded site with pond. Open floor plan features a floor-to-ceiling fieldstone fireplace, gourmet kitchen with high-end stainless appliances and granite and copper counter tops. Custom cherry cabinetry and flooring throughout. Tongue and groove pine vaulted ceilings. Dual heating system; loaded with energy-saving insulation. Full walk-out basement with tons of light, finished family room, fireplace and bedroom. 2 decks and patio surround perennial gardens. 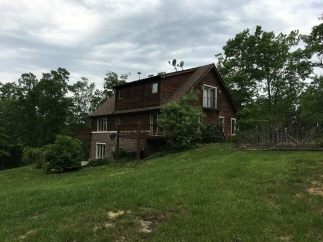 Minutes to taylorsville lake. So much to see -- you won't be disappointed! Plus a 20 by 40 detached garage. Data believed correct but not guaranteed. Buyer to verify data prior to offer. Agents read agent remarks.